ES&T: In recent years, Rheinmetall has undertaken major development efforts in the area of laser weapons. What effect can laser weapons achieve? Jung: Lasers can significantly expand the spectrum of military effect. Laser weapons are precision weapons whose effect is restricted to a tiny spot. At low power, for instance, they can dazzle optronics, so that the users can no longer "see". At higher power levels, lasers can cut or penetrate structures. This can be used for example to destroy munitions or neutralise unmanned aerial systems. The list of applications can be expanded indefinitely. ES&T: So the greater the distance the more powerful the laser needs to be? Jung: In principle, yes – though of course this depends on the characteristics of the target. In the class up to 20 kW, optronics can be neutralised out to a distance of five to ten kilometres. We've proven that we can combat aircraft and UAVs up to three kilometres away. We can render medium-calibre munitions and munitions in munitions boxes harmless at up to two kilometres. If we consider combating mortar shells, we're talking about the 100 kW power class, and to combat aircraft we need to be thinking about a power class significantly above 120 kW, because we need to assume distances of four kilometres and more. You always have to consider every scenario individually so as to determine how much time is available to combat a target and what power level is required. Theoretically of course you could neutralise an aircraft with a lower-power laser – say 20 kW – but then you have to hold the beam on the target longer than is realistic for rapidly flying objects. ES&T: What operational advantages do laser weapons offer? Jung: What you see is what you hit; you don't need a computer to determine how much to lead the target by. 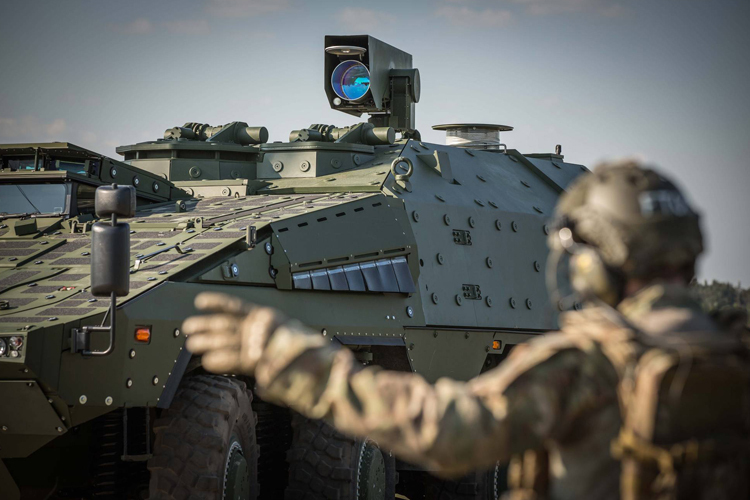 Laser weapons stand for extremely high precision on target and high multi-target capability, and users aim the weapon at a new target very quickly. They also offer a great logistic advantage. As long as the platform is supplied with power, the weapon remains combat capable. The Americans call this a "deep magazine". The weapon doesn't require any munitions that need to be stored, transported and guarded. The costs for a combat engagement are extremely low, as the laser does not require any consumables, so that ultimately the only costs are for electricity generation, which comes to less than one euro per engagement. Not to mention noiselessness. There are scenarios in which that is a decisive advantage. ES&T: Assuming funding is forthcoming: How long do you think it will take until a system is deployable? Jung: For marine use, we are assuming on the basis of our testing to date that if we get the green light, we’ll be able to realise a laser weapon system in the power class 10-20 kW on the carriage of the MLG27 light naval gun. This system offers the possibility of neutralising current seaborne threats such as fast attack boats, jet skis, skiffs and UAVs. As the system is recoilless, it could be deployed, perhaps in containerised form, on ships or boats that currently have little or no close-in defence capability. ES&T: And is effect on land from the sea conceivable? Jung: Indeed, that's also an issue that we're focusing on right now. When a ship is cruising along a coast, it very quickly comes within range of standard anti-tank missiles, which also represent a threat to marine units. Using a laser weapon system, you can detect a combatant, dazzle his optronics or act directly on the missile's structure to neutralise it. ES&T: What possibilities do you see for the integration of a system like this in land vehicles that are already in service? Jung: Our aim is to integrate a laser weapon system in currently used vehicles. We’ve already proven this with a demonstrator in the 10 kW power class for a Boxer Armoured Transport Vehicle (medical module). At the IDEX trade show in Abu Dhabi last year, we showed how a 20 kW laser effector can be used to replace the weapon of a Lance turret in the standard mission module of the Boxer. We’re extremely flexible when it comes to the vehicle and weapon platform. All that’s needed is a certain minimum volume and scope in the load-out. Containerised solutions can be transported anywhere by truck for stationary deployment, and at a later date perhaps even with the option of firing while on the move. ES&T: What are the limitations of this technology compared to others, such as ballistic effectors? Jung: Admittedly, its performance capability is subject to certain limitations under weather conditions such as heavy rain and snowfall or fog. From experiments in Switzerland under weather conditions from +29° in August to -12° in October and November plus snow and rain, we know that we can only not use the system in a heavy snow fall, as the snow crystals reflect too much. In heavy fog, targets are not visible. However, these limitations also apply for many of the potential targets, which cannot be used under these weather conditions either. ES&T: Will laser weapons replace conventional tube weapons? Jung: We're not talking about replacing, but rather complementing our current conventional weapons. Laser weapons offer capabilities that the military does not have right now. I like to cite a historical comparison. To my mind, the introduction of the laser is much like the introduction of the first firearms in the Middle Ages. There's a new system with new capabilities, but it’s not going to supersede other systems right away. Laser weapons offer previously unheard-of precision and make it possible to significantly limit collateral damage. Their flexibility is also unique, because they can be switched from low-intensity interference mode to high-intensity neutralisation mode extremely quickly. ES&T: Let's talk about the sophisticated technology of laser systems. What special requirements apply for laser emitters that can be used in weapons? Jung: One important factor is a certain laser power. The beam quality is also relevant because it’s an indication of how well the beam can be focused. As we want to focus it intensely, we're only interested in lasers with low M2 values. The optimum value in terms of the theoretical minimum would be 1. We're using lasers with an M2 value of 2.5 or lower. Efficiency is a further key factor: the greater the efficiency, the smaller and lighter the energy supply and cooling systems can be. The dimensions of the laser weapon system must limit the carrier platform on which the weapon is used as little as possible. And of course reliability is a major factor. ES&T: How can you utilise the technologies that German industry is using for other, civilian purposes? Jung: At the moment we're only using lasers that are also used for industrial welding, for instance in car manufacturing. For us, this has the advantage that we're working with mature, dependable technologies and don't need to invest in their development ourselves. We're working here in the 10 kW power class. There are also higher-power industrial lasers, for instance 50 kW, but the corresponding M2 values are greater than 10, so that these are not of interest to us. One major advantage for us is that Germany is a leader in laser technology. We can build on the expertise in place at research institutes and suppliers. 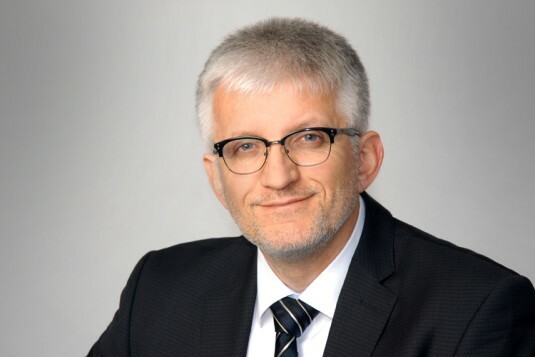 ES&T: What development does Rheinmetall do? Jung: Firstly, we're defining the requirements for the laser weapon system and breaking these specific weapons-technology requirements down to the level of individual components such as laser, beam guidance system, energy supply and cooling. For military applications, functionality must be ensured under conditions that are not relevant in the civilian sector – I'm thinking here about insensitivity to vibrations or temperatures, for instance. This requires various modifications to commercial off-the-shelf components. We're designing the entire beam guidance system and embarking on the issue of fine tracking. We're deciding what effect we want to have on the target, and defining the laser weapon system in detail on the basis of these parameters. There are a lot of technological challenges to be mastered to transform a laser into a laser weapon system. 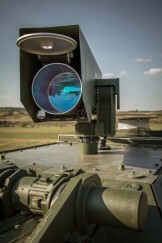 ES&T: Rheinmetall also developed beam superimposing technology. What does this do? Jung: We're working with commercial lasers, and right now the strongest usable power category is the 10 kW class. However, you need more than 10 kW for applications at greater distances or against harder targets, which means that we need to aggregate the power of multiple lasers at the target. We achieve this with standard laser modules of 10 kW each, whose power is superimposed at the target using beam superimposing technology. ES&T: Energy production was a problem for a long time. What’s the situation today? Jung: The efficiency level problem has become a lot less urgent with the transition from gas lasers to solid-state lasers. Previously, we were attaining efficiencies of five to ten percent for gas lasers; today we're achieving efficiencies of close to 30 percent. In other words: To generate 1 kW of laser power today, we need only a little more than 3 kW of electrical power, which represents a huge reduction with respect to the requirements for the carrier platform – particularly as you always have to consider that the energy for the electrical lasers is only required when the laser is actually beaming. Engines mounted in motor vehicles today typically output 80 to 100 kW, and can generate considerably more than 20 kW of laser power electrically. ES&T: Has the Bundeswehr shown any interest in this development or are you doing this on your own initiative? Jung: We've received research and technology orders. 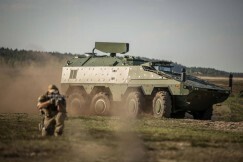 Rheinmetall has additionally invested its own money in order to move this technology forward. We owe our current technological leadership position in this area to this commitment. Dr-Ing Markus Jung, Head of Directed Energy, Technologie & Innovation, Business Unit Combat Systems, Rheinmetall Defence. Source: Europäische Sicherheit & Technik, issue 2/2016, author: Dr. Peter Boßdorf.